Yum! I need these in my life. I saw someone mention cutting the marshmallows in half to make them easier to eat, but you’ll never guess what I found in the store the other day. STACKABLE MARSHMALLOWS! The are flat and square for easier smore’s consumption! Ah seriously?! I need those! What store did you see those stackable ones in? I’d love to get this! These are so cute! Put in a cute little bag, they would make great party favors or gifts! *s’mores (apostrophe in the wrong place) oops! Nibble, nibble. Snuggle snuggle. Love, love. I love these little gems from Trader Joe’s and was just thinking they would be easy to recreate! Thank you for showing me the way! Well, those pretty much look amazing. I picutre your house like the willy wonka factory..or at least your kitchen because everything you produce is sweet perfection! How could anyone not love s’mores? Thank you for recreating those tasty little treasures! They are a staple on all of my TJ’s trips and I never thought about making them myself. As always…YOU ROCK! I’ll skip the home-made grahams and the home-made marshallows because I need to eat these as quickly as possible! Mmm, s’mores! I need more of these in my life. :) These are adorable! Have you ever made s’meeps? My family keeps stashes of marshmallow peeps so we can roast them over a fire and make s’mores with them. The caramelized sugar works wonders! These look so good. Seriously good! Oh good God- that looks incredible! I looooooove Smores, and this would be the perfect snack for the movies or anytime you’re not at a campsite basically.. love. i agree! anything by trader joe’s is usually absolutely DELICIOUS! I hear they have a chocolate molten lava cake thing (haha dont know the exact name apparently :P) thats rediculously good. I have yet to buy it ( i know, shame on me) but I want to!! They usually have them up by the register, or up above in the frozen aisle. I want to try them!! S’mores are totally my thing. The only thing that might make this even better is to add a layer of peanut butter in there. Mmmmm! hahahaha love the “i’m blurry…” photo :) They look freaking amazing! I will trade you these for donuts! Seriously drooling over here. I want these in my mouth right now. Drooling! S’mores are my favorite. I’m thinking of making them two ways; milk and dark chocolate. Is using a chocolate graham cracker for some of them a little over the top? Nah. We have S’more Saturday Night as a tradition in the summer. We love them! Sounds super easy and quick…and they are so cute. Why use Kellogg’s® Rice Krispies®?As the first crisped rice cereal, Kellogg’s® Rice Krispies® has been bringing families together in the kitchen for over 80 years. 1. Coat 13 x 9 x 2-inch microwave-safe dish with cooking spray. Arrange KEEBLER GRAHAMS ORIGINAL crackers in single layer in dish, breaking crackers as needed to fit. Sprinkle marshmallows evenly over crackers. 2. Microwave on HIGH 1 minute or until marshmallows are puffy. Remove from microwave. Cool completely. 3. In 2-quart microwave-safe mixing bowl combine chocolate morsels, corn syrup and butter. Microwave on HIGH about 1 1/2 minutes or until chocolate is melted, stirring every 30 seconds. Stir in peanut butter. Add KELLOGG’S RICE KRISPIES cereal, mixing until combined. 4. Spread evenly over marshmallows. Cover and refrigerate about 1 hour or until firm. Cut and store in airtight container in refrigerator. Follow step 1 above using 13 x 9 x 2-inch baking dish coated with cooking spray. Bake at 375°F about 7 minutes or until marshmallows are puffy. Cool completely. In medium saucepan combine chocolate morsels, corn syrup and butter. Cook stirring constantly, over medium-low heat until melted. Remove from heat. Stir in peanut butter. Add KELLOGG’S RICE KRISPIES cereal, mixing until combined. Complete as in step 4 above. Oh wow. 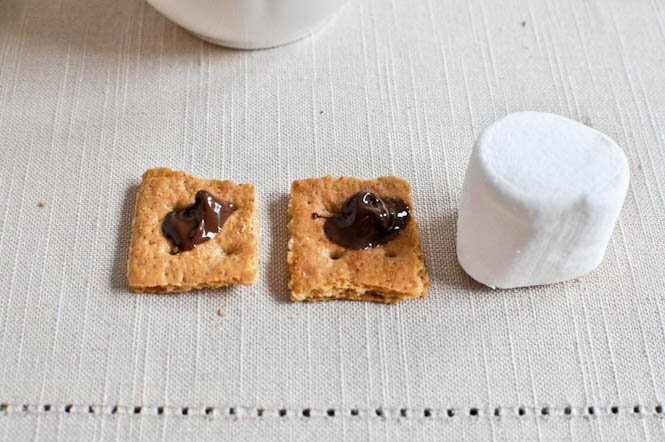 Now what if one were to smash some graham crackers and melt the marshmallows and stir them together before dipping in chocolate? Too much work? Or would it be awesome? My project for tomorrow, for sure! Heaven! I would love to make these but here in Denver there are no Trader Joe’s. Any alternative suggestions? You don’t need anything from Trader Joe’s to make these! Wow…fastest way of making a smore ever. Breathing heavy. That’s even faster (and a little less messy, heyo!) than cupping a marshmallow, chocolate, and graham cracker inbetween the palms! In Australia we do the same but for the glue we use a dollop of jam (i think maybe you guys call is jelly) – like a strawberry jam or something simular – taste awesome! oh. em. gee. this is amazing!!!! i’m pretty obsessed with TJ’s smashing s’mores as well. Completely mouth-watering! I just got back from camp and had s’mores overload there. What a wonderful dilemma to have. I eat in the car almost everytime I go to the grocery store. In fact, I make it a point to pick up something snacky that I CAN and WILL tear into the moment I get my groceries loaded into the trunk. Also, I haven’t had a smore all summer. That must change. And I made your ‘roasted potatoes to change your life’ last night and they were a major hit. You are the best. Holy yum! Why didn’t I ever think of this. Gosh, I am totally having a slap on my head type of week. Thanks for sharing these “smashing” smores. I feel like I have to talk like a rich person when I use the word “smashing”…. “They’re smashing, darling, just smashing”. Did you hear it? Did my accent come through? These are cute! Anything s’mores sounds good to me!! These look exactly like what I have been looking for ALL day!!! YUM! Ever seen those “Jet-Puffed” marshmallows which are shaped like slabs especially for s’more-making? I saw them on my recent visit to the USA and I was completely fascinated. What about SLABS of homemade smashing s’mores? i went to a phish festival [superball ix] over fourth of july weekend and the ben + jerrys tent was there. they were giving out phish food and let me tell you, after a few too many ithacas, wow. just wow. forget getting back to the campgrounds, you were sitting in front of the ferris wheel enjoying this crazy delicious party in your mouth. I also have a major addiction to S’mores! So glad to know I am not alone. These look perfect! Oh and I wish I had a Trader Joes near me so I could try their version, but I guess I will just have to make them at home! I’m a new reader and I just wanted to say three things: 1) Your blog is amazing and I can’t stop obsessively going through all of your archives to read old posts 2) I loved reading about your career change from personal trainer to writer–very inspiring and 3) Keep doing what you’re doing because you’re awesome at it! Oh wow! I love me some s’mores! These look really yummy! I just made these mini size for my kids. Dipped mini mellows in chocolate then in gram cracker crumbs. They are sooo cute. Kids loved them.